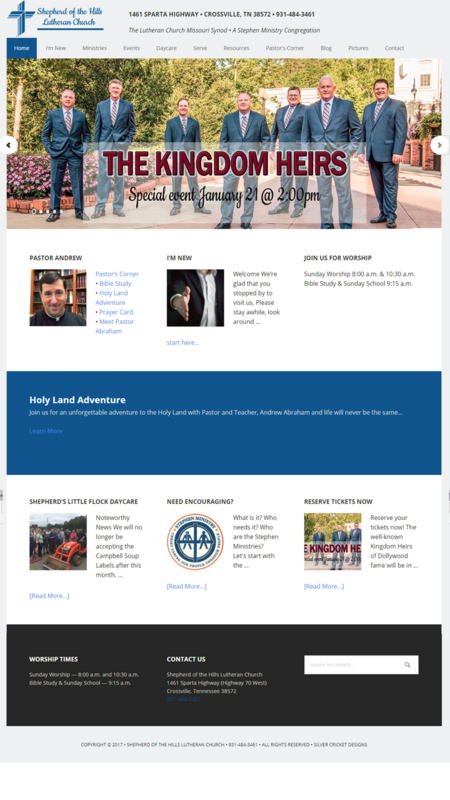 Shepherd of the Hills (Crossville, TN) was ready for their website to be redesigned, the website also included Shepherd’s Little Flock Daycare. Their existing site had been designed many years ago and was out of date and did not adequately reflect who the church or Daycare center were any longer. The church wanted to devote a section to welcoming visitors to their church and give more information on their ministries. For the regular attendees and members they wanted an area for how and where to serve in the church and place to share photos of the many activities they participate in throughout the year. This is an active church in their community and now their site gives them a tool to show who they are, what they do and most important how God uses them to share His love. The site was designed using WordPress and a mobile friendly theme. The new design has many features that the church can use as it continues to grow.